Pinterest is one of the best social network sites that focuses its tools on organization and moderation of various events or activities. If you ever had need to plan a wedding, organize parties, decorate homes, or even organize your recipes, Pinterest will provide you with the comprehensive list of easy to use tools to do so. But fear not, you are not alone in this. With a few clicks, your plans and pinboards can become visible to your friends or entire Pinterest community who will gladly help you with anything you need. With fast and intuitive interface, and effective search engine that will help you to find and browse pinboards made by other people, you will most surely receive a big boost of productivity and knowledge. Great Social photo sharing service! Easily archive the things you live with Pinterest! In the world where social sites are appearing with each passing day, only few of them manage to truly innovate and capture the imagination of the general public. One of them is without a doubt Pinterest, innovative social network hub that has taken the age old idea of a gathering data on a chalkboard and molded it into a modern form that both novices and seasoned users of modern cloud-based computing can appreciate. Fully embracing the new way of visually sharing your interests, this site will enable you not only to express yourself with least effort imaginable, but to do so in new and innovative way that you have not encountered before. Pinterest has been established in 2010 by Ben Silbermann and Paul Sciarra, and ever since then it has managed to grow with unimaginable rate. With popularity that made it THE fastest growing site in the world, today clocking at over 70 million users worldwide, Pinterest has the thriving community that surpasses many other popular image-sharing sites such as Tumblr (however it is still behind mobile phone phenomenon Instagram which as of April 2012 had over 100 million users). 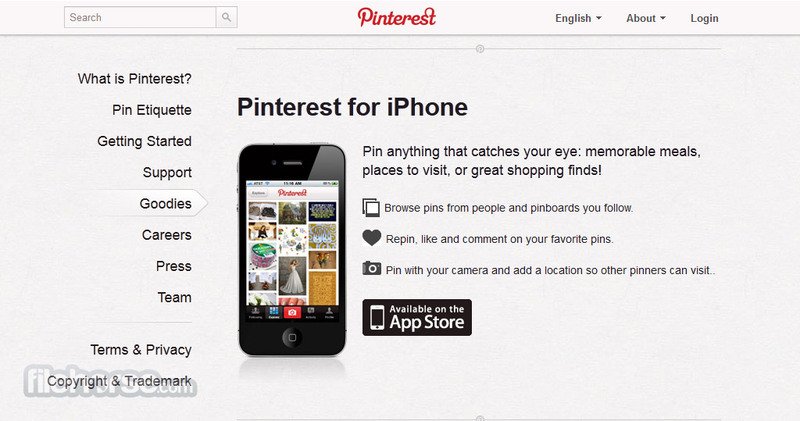 From the moment you arrive on Pinterest.com you will know that this is not just another social network website. Fully committed on sharing visual objects, Pinterest is a perfect destination for people who like to share things in a fun way. In it you can share any internet resource you have found interesting (recipes, pictures, videos, URLs) and they all will be represented with the thumbnail of much larger size than on other popular social sites. Your pins can be made in separate virtual boards, enabling you to create specialized sections for your various interests (planning a trip, pictures from a party, etc.). Even better, you can very easily search boards of other people, finding the information and entertainment you need with very little effort. With wide array of modern tools, Pinterest can also be used by people who are not interested much in sharing, but are drawn by the great visual style. Those people can use Pinterest perfectly fine as a fully cloud-enabled bookmarking service, creating the separate sections of bookmarks for their own needs. Site is also completely accessible via portable devices such as phones and tablets, making the process of collecting, managing and sharing data as easy as possible. Great Social photo sharing service! Pinterest is completely focused on visual sharing, and because of that it does not have the standard web design that you can find today with other popular social network destinations such as Facebook, Google+ and Twitter. Immediately after the bar that hosts search bar, button for menu items and your account info you will be greeted by the board filled with thumbnails, with dedicated place for activity of your friends (equivalent of “like” for Pinterest is “reprinting”). 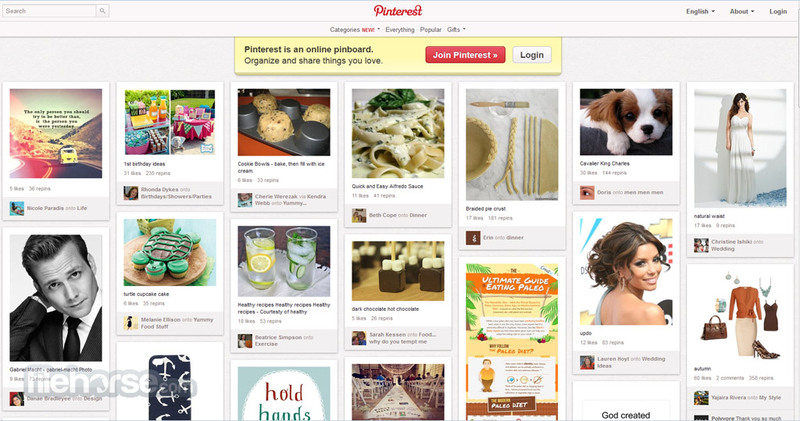 Users can create as many visual boards as they like, and set them to be either private or public. Registration process for Pinterest entails either connecting your Facebook account with it, or manually signing up by using your email address, name and country info. Additionally during registration you can elect whether or not you would like for Pinterest to start collecting data about your internet traffic, all with the goal of providing you with additional personalized experience. That data is collected from sites where you click Pinterest’s “Pin it” button, or the same button on your internet browser which you can get by using extensions or plugins. As for cost, Pinterest is completely free website without any registration fees, monthly subscription costs or premium site features. Pinterest is a modern social network destination that is perfect for people who like to share and browse visually based content from their friends. Take your bokmarks with you like you have never done before with this great service. 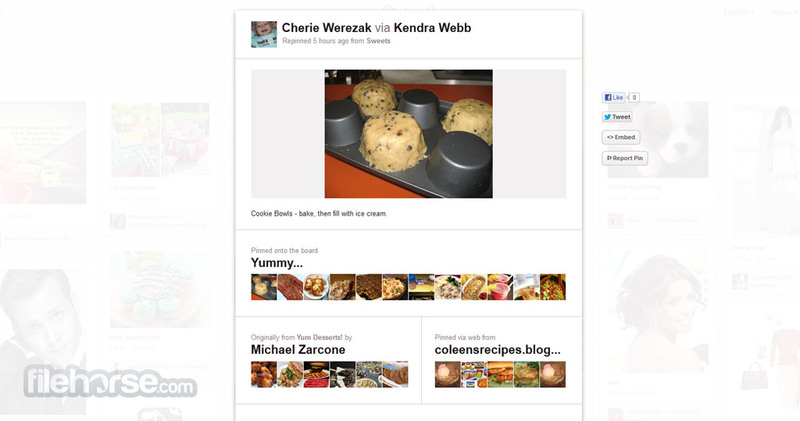 Jessica uses Pinterest to discover new gluten free recipes. She always has a collection of tasty appetizers and desserts she can cook when she’s hungry and looking for ideas. Great Social photo sharing service!